A GENUINE ISSUE OF PUNCH.DATED JULY 1911. MINOR FOXING.OVERALL CONDITION GOOD. 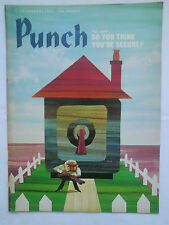 THIS IS A COLLECTION OF PUNCH MAGAZINES DATING FROM 7th JAN 1976 - 5 JULY 1977 (39 COPIES). 11th AUG - 7tH SEPT. THE PUNCH MAGAZINE OF SATIRE AND HUMOUR WAS FIRST ESTABLISHED IN 1841, THE LAST EDITION BEING IN 1992. The front cover features Harold & Mary Wilson. Series: MAD Magazine. Comics Digest. Publishing Date: July 1955. How To Get the Job You Want By Thinking.etc. Issue Number: 24. USA EDITION. Out of the Frying Pan and Into the Soup. Is a Trip to the Moon Possible?. Punch magazine No.1 July 17 1841. reprint. In overall excellent condition. No loose or missing pages. No writing/scribbles. 16 A4 pages of satire and political humour. 1st, 8th, 22nd & 29th JULY 1964. 18 x Private Eye Magazines 60s/70s/80s. Condition is Used. Dispatched with Royal Mail 2nd Class. PUNCH MAGAZINE. 7-13 JULY 1971. Punch magazines, 1952, July 2nd edition. Punch magazines, 1951, July 11th edition. JULY 3rd 1957. PUNCH MAGAZINE. 11 July - 24 July 2008. - Internally in good condition, pages crisp and clear. 9 July - 22 July 2004. - Internally in good condition, pages crisp and clear. Punch magazine 23rd July 1969. ORIGINAL. 13 July - 26 July 2001. - Internally in good condition, pages crisp and clear. 16 A4 pages of satire and humour. Condition: In good condition for 50 year old magazine. Condition: In good condition for 50 year old magazine. Complete and pages in good condition with only the odd small spot of browning. The front cover features Harold Wilson - Bridge That Trade Gap - Alms / Arms for Nigeria - Wilson’s speech bubble says “Export and Kill!”. About the proposal of Stansted Airport. JULY 22nd 1953. PUNCH MAGAZINE. JULY 20th 1955. PUNCH MAGAZINE. JULY 27th 1955. PUNCH MAGAZINE. JULY 25th 1956. PUNCH MAGAZINE. JULY 4th 1956. PUNCH MAGAZINE.